The Soviet Union and an overt Communist agenda managed by a Marxist-Leninist-Stalinist Russian government may have come to an end, BUT old guard Communists want to make Russia a global threat again. If you couple the Russian agenda with the American Left (you could say Socialist/Marxist) agenda, the United States of America is under threat from without and within. Below is an Institute for the Study of War (UnderstandingWar.org) analysis of how Russia has arrived at its current state of existence. The Kremlin’s increasingly assertive foreign policy, including its illegal occupation of Crimea in 2014 and its intervention in Syria in 2015, came unexpectedly to many in the West. . These events were nonetheless mere extensions of the worldview held by Russian President Vladimir Putin.. This worldview was built on more than two decades of compounded dissatisfaction with the West as well as Putin’s cumulative experiences in his ongoing global campaigns to achieve his core objectives: the preservation of his regime, the end of American hegemony, and the reinstatement of Russia as a global power.. Some of these ambitions were tamed, and others expedited, by external events, yet their core has remained the same and often at odds with the West.. The U..S.. believed that a brief period of non-assertive foreign policy from the mid-1980s to mid-1990s had become the new norm for Russia.. This period was not the norm but an anomaly.. Putin’s foreign policy has always been assertive, similar to Russia’s historic foreign policy.. The U..S.. may thus find itself once again surprised by Putin.. This paper examines the evolution of Russia’s foreign policy worldview since the collapse of the Soviet Union to help understand the likely next priorities of the Kremlin.. The U.S. has routinely attempted to reset relations with Russia since the rise to power of Russian President Vladimir Putin in 2000. The Soviet Union’s collapse led legions of scholars and policy-makers to pivot towards the new issues of a post-Soviet Middle East, Europe, and Asia. An entire generation of Americans hardly thought about Russia. The Russian Federation was seen as a former foe that could be integrated—albeit uneasily—into the international system led by the U.S. Yet Russia did not view the slate as clean. The Kremlin’s foreign policy narrative, by contrast, soon focused on America’s disregard for its interests and the need to achieve a multipolar international system free of U.S. hegemony. Putin has remained clear on these goals since his ascent to the Kremlin. Russia needed to recover from its weakened state, reestablish itself as a global power, and achieve a new world order that held up the Kremlin as an equal—not a dependent—to the U.S.
Putin’s twenty-year tenure in power has had a cumulative effect on his worldview. . His assertiveness has grown in step with his strengthened grip on domestic power and his growing perception that he faces only limited international pushback. His personal resentment of geopolitical slights has grown and fed back into Russia’s national security dialogue. The influence of other forceful national security leaders has also grown. Putin has responded to internal challenges by seeking foreign policy distractions. The direction of his aims has always been consistent even if the vigor and rancor with which they are pursued has increased. Putin’s public tone has mirrored this evolution.. In 2000, Putin “did not see reasons that would prevent … cooperation with NATO under the condition that Russia would be treated as an equal partner” with the West.1 By 2007, he was openly attacking the unipolar world order of the post-Cold War: “It is a world in which there is one master, one sovereign … This is pernicious not only for all those within this system, but also for the sovereign itself because it destroys itself from within … The model is flawed because at its basis there is and can be no moral foundations for modern civilization.”2 By 2014, Putin was justifying action against this system: “There is a limit to everything … and with Ukraine, our Western partners have crossed the line.”3 The core concepts of his policy remained stable even as his rhetoric shifted from cautious outreach to direct criticism. Putin’s worldview is Russia’s foreign policy. . The Kremlin’s foreign policy views largely predate the rise of Putin. Putin’s two decades in power, however, have enshrined his worldview as Russia’s. Putin’s Russia—unlike its predecessors—has no state machine or elite capable of balancing out his instincts and narratives. The Soviet Politburo typically served as a counterbalance to the rulers of the Soviet Union with the exception of Joseph Stalin. Imperial Russian had a base of influential elite that frequently shaped policy ideas with notable exceptions such as Peter the Great and Ivan the Terrible. Putin’s intimate circle of advisors is comparatively small with a contingent of military and security service leaders who have climbed with him for twenty years. Not all Russians accept (let alone support) all of these foreign policy ideas but their disagreement matters little among a population by-and-large focused on day-to-day issues. Putin’s and Russia’s foreign priorities, at least for the moment, are the same. 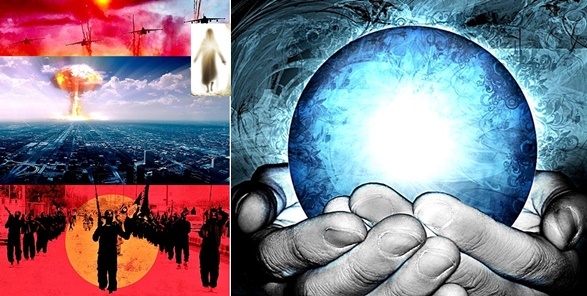 The line between narrative and belief has blurred over the last twenty years.. The Kremlin’s talking points are propaganda and it is easy to dismiss them as such. However, these narratives have been repeated and amplified for two decades. They have become self-sustaining and rebounded back into the national security debate. Even if Putin’s inner convictions differed from his rhetoric, he has imbued an entire generation—indeed, an entire national psyche—with a sense of grievance against the West. These narratives will thus inform the overall arc of the Kremlin’s foreign policy for years to come. The following sections trace the articulation and evolution of this worldview since the fall of the Soviet Union. Americans tend to group the major events and thoughts of the past two decades into a series of historical periods such as the Cold War, the 1990s (prior to 9/11), and the administrations of George W. Bush, Barack Obama, and Donald Trump. Russians hold a different view of recent events. These divergent interpretations of history—often reflected in rhetoric—are crucial to understanding the antagonistic worldview of Putin vis-à-vis the U.S. and NATO. Russian President Boris Yeltsin’s tenure focused on establishing post-Soviet Russia and putting it on a democratic trajectory amidst enormous internal challenges. Yeltsin became the first president of the newly-created Russian Federation after the dissolution of the Soviet Union at the end of 1991. Russia’s economy soon collapsed from the shock of a rapid attempted transition from centralized control to the free market. Millions fell into poverty. State structures, including law enforcement and the military, were greatly weakened. Criminality spread across the former Soviet Union. An economic oligarchy emerged as a small number of individuals rapidly accumulated vast wealth, often taking advantage of the privatization of undervalued state assets. Russia suffered several terrorist attacks originating from groups in the North Caucuses, particularly the Chechen Republic. Yeltsin launched a largely failed military campaign to regain control over these territories in 1994. Communist hardliners meanwhile continued their efforts to regain control of Russia. They attempted to seize power violently in 1993 and then peacefully in the 1996 Russian Presidential Election. They failed both times—but both failures came too close for comfort. Russian President Boris Yeltsin worked to improve the relationship between Russia and the U.S. during his two terms in the Kremlin. However, assertive foreign policy narratives had already begun to reemerge in Russia by the mid-1990s. Yeltsin initially prioritized strategic partnership with the U.S. … and broader integration with the West.. “We have left behind the period when America and Russia looked at each other through gun sights,” Yeltsin said in his historic 1992 Address to the U.S. Congress.4 Yeltsin’s Foreign Minister Andrey Kozyrev advocated for Russia to join the club of developed civilized democracies and practice equal cooperation with the former Soviet Union.5 Russia and the U.S. signed numerous bilateral cooperation agreements.6 Russia joined NATO’s Partnership for Peace, which aimed to build trust between NATO and the former Soviet Union. Russia withdrew all of its troops from Germany by 1994.7 Russia also engaged the West for help with its economic reforms. The Kremlin adopted a new and more assertive National Security Concept in 1997.. The document identified “NATO expansion as a national security threat” and warned that “other states are activating their efforts to weaken” Russia.14 The document also outlined more paternalistic policies towards the former Soviet Union. It included a passage prioritizing the “proclamation of the Russian language as the state language and the language of international communication of the people of Russia and the Commonwealth of Independent States as a critical factor towards unifying the people of multinational Russia.” The document nonetheless concluded that the main threats to Russia’s national security were predominantly domestic and non-military challenges. Yeltsin and the U. .S. . suffered their biggest diplomatic divide over the intervention of NATO in Yugoslavia in 1999. . Yeltsin opposed airstrikes by NATO against Serbia during the Kosovo War and called on the U.S. President Bill Clinton not to “take this tragic step” in the Balkans.15 NATO nonetheless launched the operation in order to end human rights abuses by Serbian President Slobodan Milosevic—an ally of Russia—against ethnic Albanians in Kosovo. It occurred without authorization from the UN and over the protests of Russia. Yeltsin nonetheless responded within the framework of NATO by insisting upon the inclusion of the Russian Armed Forces in the subsequent international NATO Kosovo Force (KFOR). Yeltsin and his foreign policy team did not yet operate within the framework of a grudge against the West.. They were largely pragmatic, sometimes confrontational, and increasingly assertive—but rarely bitter.20 Primakov laid out some of the most important theoretical bases of the policy later pursued by Putin but neither he nor Yeltsin acted on them seriously while in office. Russia remained too weak to pursue any of its emerging ambitions, especially after it suffered a major financial crisis in 1998.21 Yeltsin regardless was unlikely have turned hard against the U.S. His tenure was marked by a determination to build democratic institutions, integrate with the West, and prevent the return of the Communists. Yeltsin resigned and appointed Russian Prime Minister Vladimir Putin as Acting President on December 31, 1999. Russia was still recovering from its financial collapse in 1998. Economic oligarchs were actively influencing the political processes of the Kremlin. Putin was leading a second campaign in Chechnya which started in 1999. Russia continued to suffer from deadly terrorist attacks, including a major hostage crisis in Moscow in 2002 that killed 130 individuals. Putin nevertheless focused on domestic affairs during his first years in office and revealed little animus against the West.. Putin viewed the weakness of the state and its internal economic turmoil as existential threats to Russia. “For the first time in the past two hundred to three hundred years, [Russia] is facing a real danger of sliding into the second and possibly third echelon of world states,” Putin wrote the day before his appointment as Acting President.24 He focused on rebuilding the economy and the strength of the government as well as consolidating his own grip on power. He prioritized strengthening law enforcement and security services, taming the oligarchs, eliminating political opponents, and regaining federal control over the Chechen Republic. Nikolai Patrushev replaced Putin as FSB Director in 1999. Patrushev currently heads Russia’s Security Council—the equivalent of the U.S. National Security Council (NSC). Sergey Chemezov worked for Putin in Yeltsin’s Chemezov is currently the CEO of Rostec, a major state-owned defense-industrial conglomerate. Sergey Ivanov served as the head of Russia’s Security Council in 1999. Ivanov held various prominent roles in Putin’s Kremlin including Minister of Defense, First Deputy Prime Minister, and Chief of Staff of the Presidential Administration. The idea that Russia must “fight to exist”—one of the key tenets in Putin’s foreign policy—also emerged at this time. Putin believed that the U.S. provided covert support to terrorists in Chechnya in order to destabilize Russia.28 The West in turn criticized the ongoing military campaign in Chechnya for its brutality and high levels of civilian casualties.29 Putin believed that if he conceded to calls to decrease the intensity of his military operations, Russia would face disintegration. His broader narrative reflected a core fear of state collapse and loss of territory. This rhetoric also tied back into earlier sentiments within the Kremlin that Russia was weak after the dissolution of the Soviet Union and risked losing sovereignty to external forces—in particular, the U.S.30 It followed, according to this view, that Russia must assert itself on the global stage to maintain its independence. The Kremlin began to view a less active foreign policy as another sign of lost sovereignty, a view that persists to the present day. 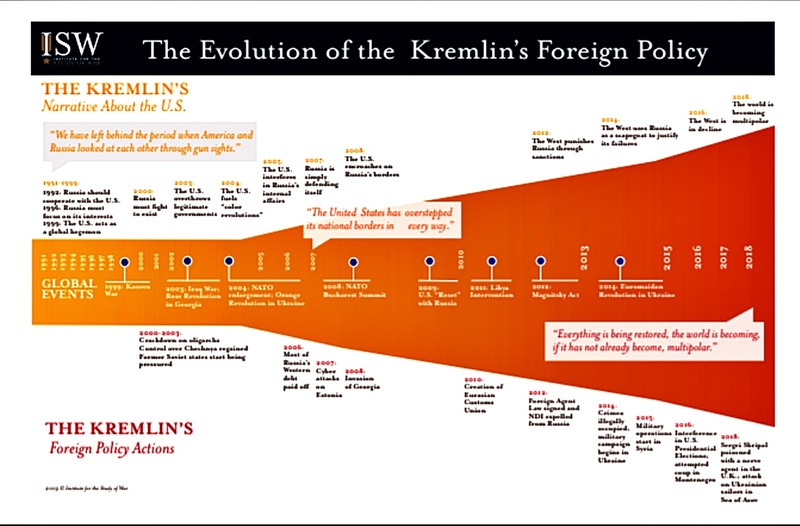 Putin’s foreign policy experienced an inflection in 2003 and 2004. A series of external and domestic factors accelerated Putin’s ambitions and foreign pursuits. He became more assertive on the international stage as he began to solidify his grip on domestic power. Putin established in this period a firm grip on the internal affairs of Russia.. Russia quickly repaid its outstanding debts to the West, meeting its obligations to the International Monetary Fund (IMF) by 2005 and the Paris Club by 2006.35 Both of these payments occurred ahead of schedule. The debt repayment was a point of personal pride for Putin that demonstrated the regaining strength and independence of Russia.36 Meanwhile, Russia was gradually restoring control over Chechnya after a military campaign that largely destroyed the regional capital of Grozny. Chechnya passed a constitution in 2003 that ostensibly granted broad autonomy to the Chechen Republic but preserved firm control from the Kremlin. Putin’s ambitions to regain control over his perceived rightful sphere of influence accelerated after a series of global events in 2003 and 2004.. The 2003 U..S.. Invasion of Iraq and overthrow of Saddam Hussein struck several nerves with Russia. Putin held a strong aversion to forced regime change given his concerns about preserving his own regime. He was upset about a loss of influence in the Middle East due to the destruction of a former Soviet ally. He also resented the U.S. for acting over his objections and without explicit authorization by the UN (similar to the Kosovo War). Putin was even more concerned by the “color revolutions” that saw a wave of peaceful protests against corrupt regimes in several former Soviet states, including Georgia’s 2003 Rose Revolution and Ukraine’s 2004 Orange Revolution. Putin accused the U.S. of instigating the revolutions and imposing “external governance” over these states.43 This perceived threat was deeply concerning to the Kremlin. It undermined the stated national security goal of creating a “friendly belt of neighbors” and presented a potential challenge to the regime itself. Putin held up the ‘color revolutions’ as an object lesson and a warning, stressing that the Kremlin “should do everything necessary so that nothing similar ever happens in Russia.”44 Putin internalized the notion of the “color revolution” as a method of covert destabilization by the West. The Kremlin nonetheless remained relatively moderate in its rhetoric against the West.. “It was difficult for us when the U.S. unilaterally withdrew from the ABM Treaty. It was difficult for us when, bypassing the UN Security Council, they started the war in Iraq. Nonetheless, our countries have managed … to prevent a return to confrontation … [through] common sense and the understanding that common strategic interests … outweigh any tactical differences,” stated Russian Foreign Minister Igor Ivanov in 2004.47 Putin also stated at the time that the U.S. remained a priority partner of Russia on some of the most pressing global problems, such as the War on Terror.48 The relative calmness of this rhetoric belied the fact that Putin was preparing to start speaking and acting openly to counteract what he perceived as a growing disregard for his interests. Putin easily won reelection in the 2004 Russian Presidential Elections. Russia benefitted from high oil prices. Putin later (due to term limits) accepted the post of Russian Prime Minister in 2008. He nonetheless continued to largely dictate the policies of the Kremlin and Russian President Dmitri Medvedev. The Russian Constitution was modified to change the length of presidential terms from four to six years, effective after the departure of Medvedev. Putin increasingly pushed his foreign policy campaigns towards open confrontation in this period. He escalated his rhetoric against the U.S. and NATO. He simultaneously limited the civil liberties of Russians, presenting the measures as necessary to defeat subversion by the West. The Kremlin launched a set of campaigns to regain control over former Soviet states..
Russia launched a major information campaign to restore its diminished political influence in Ukraine after the 2004 Orange Revolution. This campaign evolved into a decade-long effort to inflame domestic grievances and fuel popular sentiments against the West and the central government in Kyiv. The Kremlin would tap into this groundwork to launch its subversion campaign in Eastern Ukraine in 2014. The Kremlin framed the continued engagement of the U.S. and NATO with Ukraine and Georgia as national security threats to Russia.50 Russia invaded Georgia in August 2008 —four months after the 2008 NATO Bucharest Summit in which NATO signaled its ultimate intent to incorporate Georgia into NATO. Putin carved off the regions of South Ossetia and Abkhazia, and subsequently recognized their unilateral declarations of independence from Georgia (made possible by the continued presence of the Russian Armed Forces). Russia continued to expand the Eurasian Economic Union (EEU), which now includes Russia, Belarus, Kazakhstan, Armenia, and Kyrgyzstan as well as a free trade agreement with Vietnam. Putin also attempted to coopt Moldova, Ukraine, and Georgia into the EEU, although all three countries ultimately chose instead to sign association agreements with the European Union. Russia is still attempting to use the EEU as a tool to build regional influence and global credibility through agreements with states outside of the former Soviet Union such as Egypt. Putin expanded on his narrative criticizing American hegemony and advocating for the return of a multipolar world.. Putin stated that “attempts to rebuild modern multifaceted civilization, created by God, according to the barracks-room principles of a unipolar world are extremely dangerous” during a visit to India in 2004.51 Putin later elaborated on this narrative at the 2007 Munich Security Conference. “We are seeing a greater and greater disdain for the basic principles of international law … The United States has overstepped its national borders in every way.”52 He accused the West of using international organizations as “vulgar instrument[s] designed to promote the foreign policy interests of one or a group of countries.” This rhetoric would become a central line of argument for the Kremlin. “The ambitions of one group have grown so much that they are presented as the opinions of the entire world community, which they are not,” Putin stated in 2014. Putin also started to introduce aggressive rhetoric against NATO.. Putin stressed at the 2007 Munich Security Conference that NATO’s expansion was intended to encircle Russia.53 This statement was a departure from his initial reaction three years prior, in which he claimed that the enlargement of the alliance did not pose a national security threat to Russia. The context of this statement highlighted the increasingly combative tone adopted by Putin. The intervention of NATO in Libya in 2011 further fueled Putin’s resentment of the West. .
Putin condemned international support for the intervention as a “medieval call for crusades.”54 He nonetheless ran into disagreement with then-Russian President Medvedev, who asserted that “all that is going on in Libya is connected with the outrageous behavior of Libya’s authorities and crimes that were completely against their own people.”55 Russia, possibly as a result of this internal debate, did not veto a resolution by the UN Security Council to impose a “no-fly zone” over Libya in 2011. The intervention eventually escalated into a full-blown military campaign that resulted in the overthrow and death of Libyan President Muammar Gaddafi. Putin may have held genuine fears of a ‘color revolution’ in Russia but his public accusations also aimed to justify domestic oppression in the face of an external threat from the West. The Kremlin accused the U.S. State Department of interfering with its judicial system after the U.S. voiced concerns about the arrest of Khodorkovsky in 2003.64 This idea of malign foreign interference itself was not new. The 1997 Russian National Security Concept mentions the threat of “purposeful interference by foreign states and international organizations in the internal life of Russia’s peoples.” Russia’s assertion that foreign press statements constituted itself an interference in sovereign affairs, however, aligned with Putin’s larger effort to redefine state sovereignty as forbidding even international commentary on the internal affairs of Russia. Putin was thus unimpressed by the announced “reset” of relations with Russia by U..S.. Secretary of State Hillary Clinton in 2009.. U.S. President Barack Obama stated that the U.S. would abandon plans to build a missile defense shield in Eastern Europe in September 2009.65 Putin praised the decision but rejected the idea of any reset in relations. “We are not talking about ‘reset’ … The U.S. Administration offered us this term,” Putin stated in 2009 and 2012.66 The divergence in worldviews between the U.S. and Russia remained stark despite outreach from the West. Putin was reelected as Russian President in 2012. He continued to crack down on civil liberties and protests against his reelection. Russia’s economy was stabilizing. Russia was accepted to the World Trade Organization in 2011. The World Bank labeled Russia a high-income country in 2013.67 In 2014, Ukrainian President Victor Yanukovych suspended the signing of an association agreement with the European Union—sparking the Euromaidan Revolution. A series of protests forced Yanukovych to flee Ukraine. Meanwhile, the Syrian Revolution—part of the wider Arab Spring—descended into the Syrian Civil War. Russia interfered in both countries. The West began to impose sanctions on Russia for its violations of international norms. The Russian ruble collapsed due to the sanctions as well as a drop in global oil prices. Putin won a third term as Russian President 2012. He moved quickly to regain and expand his domestic control and global influence. Putin soon faced one of the most serious anti-regime protests during his time in office as mass demonstrations rallied against perceived electoral manipulation in the 2011 Russian Legislative Elections and 2012 Russian Presidential Elections. Thousands protested against Putin’s inauguration to a third presidential term in Bolotnaya Square in Moscow in May 2012. The Kremlin in turn detained hundreds of protesters and dozens of them in what became known as the ‘Bolotnaya Square’ Case. Street protests continued but largely died out by July 2013. Putin continued to pressure civil society in the name of defending Russia against the West with the 2012 Foreign Agent Law.. The law, which granted him the authority to expel a number of American NGOs from Russia, was one of the first acts of his third term. The law was partly a response to the passage of the Magnitsky Act by the U.S. in 2012. The Magnitsky Act aimed to punish officials responsible for the death of Sergey Magnitsky, who died in prison in Moscow after investigating fraud involving Russian officials in 2009. Putin has pushed a narrative of the accelerating decline of the West. . Putin attributes global trends, such as the rise of populism, to the failure of the current governance models in which citizens lose trust in their leaders and the value of democracy.79 “Even in the so-called developed democracies, the majority of citizens have no real influence on the political process and no direct and real influence on power,” Putin stated in 2016.80 He added that “it is not about populists … ordinary people, ordinary citizens are losing trust in the ruling class.” The Kremlin reinforces these attacks on democratic processes as part of its effort to protect its regime against an internal revolution as well as its global campaign to undermine rival democratic institutions in the West. The Kremlin frames all of its campaigns as defensive measures that are part of an attempt to restore balance to international relations.. The Kremlin justifies its actions as a response to any number of provocations, escalations, and parallel actions by the U.S. and NATO.81 “Of course we should react to [NATO’s military buildup]. Vladimir Putin won his fourth term as Russian President in March 2018. Putin’s core objectives remain constant—the preservation of his regime, the end of American global hegemony, and the restoration of Russia as a mighty and feared force to be reckoned with on the international stage. Some of his foreign policy pursuits are purely pragmatic and aimed at gaining resources. Others are intended for domestic purposes and have nothing to do with the West. Most are justified, however, as responses to alleged threats, aggressions, lies, and interference by the West. Putin may believe that he is approaching his goal of a multipolar international system. “Everything is being restored, the world is becoming, if it has not already become, multipolar,” he stated in 2018.85 He has not yet offered the vision for his next goals in this new order, but they will almost certainly involve further reductions in the global operations of the U.S. and its allies. Putin’s assertiveness has been accelerated or dampened by various factors over time, including his confidence in his domestic grip on power, his economic stability, his dependence on the West, and his perception of the available latitude to act freely on the world stage without major pushback. The West’s actions were a factor—but not the core driver—in Putin’s foreign policy. The U.S. tried to improve relations with Russia several times after the collapse of the Soviet Union. Putin nonetheless became arguably most assertive during the Obama Administration even as the U.S took strong steps to make amends with Russia, including a halt to plans to build a missile defense shield in Poland. The West hesitated for years to impose penalties on Russia for its repeated violations of international laws and norms including its invasion of Georgia and its cyberattacks on Estonia. The West only gradually started to impose sanctions on Russia after persistent human rights violations such as the death of Sergey Magnitsky or undisputable aggression such as the occupation of the Crimean Peninsula. It wasn’t until the Kremlin’s interference in the 2016 U.S. Presidential Election that most Americans finally became cognizant of the full threat posed by Russia. Russia. Putin notably has almost never used similar rhetoric against China, which arguably presents one of the biggest national security challenges to Russia. China continues to expand its influence in places that Putin claims are beyond his ‘red lines’— the former Soviet Union and Russia itself. Yet Putin continues to condition his population to defend against NATO—an alliance that is currently struggling to persuade its members to devote two percent of their gross domestic products to military spending. The West’s behavior has not altered the fundamental principles guiding Putin’s foreign policy thought, which has remained largely unchanged since 2000. Putin believes that Russia is a great power that is entitled to its own spheres of influence and deserves to be reckoned with in all key decisions. He asserts that the true deviation from the norm was Russia’s moment of weakness in the 1990s and that Russia is merely reemerging to its rightful place in the international system. Many of Putin’s principles are incompatible with the rules-based order and worldview of the West. Putin’s concept of national sovereignty, for example, is often at odds with the sovereignty of other nations. European states enjoy the sovereign right to join NATO. Many of them hold legitimate security concerns about a resurgent Russia. Putin, however, does not view many of these states as truly sovereign. The Kremlin often describes smaller states as externally governed or too weak to hold foreign policy agency. For this reason, it often perceives revolutions or significant internal inflections in the former Soviet Union and beyond as subversive actions by the West rather than popular movements fueled by legitimate grievances. The Kremlin believes that it must maintain control over its neighbors and preserve or expand its historic spheres of influence. Its rhetoric against NATO is less about its fear of a direct military threat and more about its fear of a loss of its power and influence. Putin often frames violations of others’ sovereignty as a defense of his own. Putin also aims to delegitimize the concept of humanitarian intervention as articulated by the West. He places his principles of state sovereignty above humanitarian concerns and asserts that legitimate governments have the right to resolve their internal affairs independent of external pressure. The Kremlin often frames any Western attempts to criticize Russia’s human rights record or those of its allies and clients as interference in sovereign internal affairs. Putin sometimes reverses this rule and justifies his external interference on general human rights grounds. Russia often reserves the right to act against foreign governments in order to protect ethnic Russians. A key example is the Crimean Peninsula. Russia intervened militarily and organized an illegal referendum to annex Crimea to Russia under the boot of the Russian Armed Forces. The referendum and subsequent occupation did not change Crimea’s status under international law—to this day, Crimea remains a legal part of Ukraine. Putin nonetheless defends his intervention as a necessary action to “defend” an “oppressed” population of Russians. Putin’s seemingly facile and convenient rhetoric can be easy to dismiss as cynical. His rhetoric is not empty, however. It is a declaration of his key foreign principle, one that is at odds with the fundamental basis of the rules-based international order – namely, that only the mighty are truly sovereign.. It is also easy to imagine that miscommunication is the source of conflict between Putin’s Russia and the West. This idea is false. Bush, Obama, and Trump have all reached out to Putin, sought to accommodate his interests as they understood them, and tried to soften policies and language that might offend him. Yet the Kremlin has responded with increasingly resentful language and actions. Putin does not trust statements from the White House. He views the U.S. as dismissive of Russia’s vital interests regardless of any changes in administrations or rhetoric. Putin fundamentally views the shape of the current international order as the primary challenge to his interests. He believes, as he has said over and over, that a global hegemony, by which he means a world order led by America, is unacceptable to Russia. Putin is no mere opportunistic predator. He may not always have a clear plan and acts expediently at times, but he knows what kind of world he wants and, even more so, what kind he does not. He seeks a world without NATO, with the U.S. confined to the Western Hemisphere, with Russia dominant over the former Soviet Union and able to do what it likes to its own people without condemnation or oversight, and with the Kremlin enjoying a literal veto at the UN Security Council over actions that any other state wishes to take beyond its borders. He has been working towards such a world since the moment he took office. His most recent statements suggest that he thinks he is getting closer. 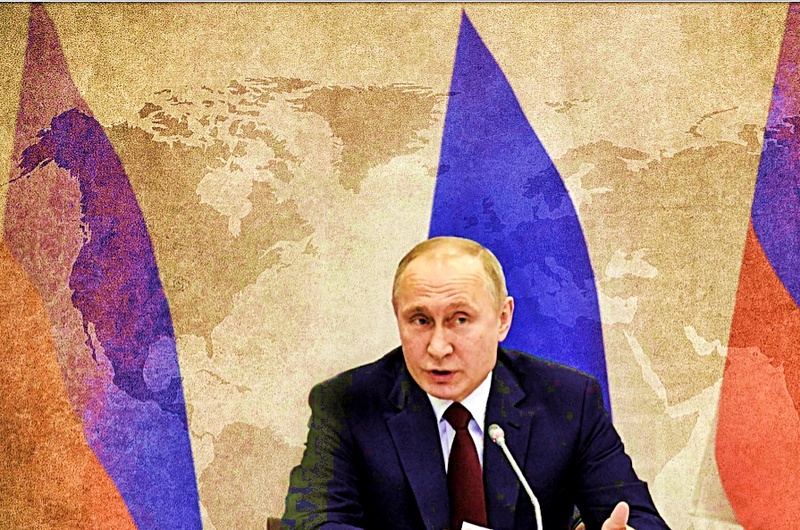 If the West aims to avoid further strategic surprise and preserve the rule-based international order, it must understand this divergent worldview and accept that Putin, when it comes to his stated foreign policy goals and priorities, is often a man of his word. Nataliya Gevorkyan, Natalya Timakova, and Andrei Kolesnikov, [First Person: Conversations with Vladimir Putin] (Moscow: Vagrius Press, 2000), http://lib(. )ru/ MEMUARY/PUTIN/razgowor.txt. Vladimir Putin, “Speech and Following Discussion at the Munich Security Conference,” Kremlin, February 10, 2007, http://en.kremlin(. )ru/events/ president/transcripts/24034. Vladimir Putin, “Address by the President of the Russian Federation,” Kremlin, March 18, 2014, http://en.kremlin(.)ru/events/president/news/20603. “Summit in Washington; Excerpts from Yeltsin’s Speech: ‘There Will Be No More Lies’,” Reuters, June 18, 1992, https://www.nytimes.com/1992/06/18/world/ summit-in-washington-excerpts-from-yeltsin-s-speech-there-will-be-no-more-lies.html. Marina Lebedeva, Ksenia Borishpolets, and Maksim Kharkevich, [Russia in Global Politics] (Moscow: Moscow State Institute of International Relations, 2013), pg. 27, https://mgimo(.)ru/upload/docs_3/Russia-v-global-politike.pdf. [“Russian-American Relations in 1992 – 1996: Reference,”] RIA Novosti, April 4, 2011, https://ria(. )ru/20110404/360851191.html; “Vancouver Declaration: Joint Statement of the Presidents of the United States and the Russian Federation,” U.S. Government Publishing Office, April 4, 1993, https://www.govinfo.gov/content/ pkg/WCPD-1993-04-12/pdf/WCPD-1993-04-12-Pg545.pdf; [“Gore-Chernomyrdin Commission,”] Kommersant, June 20, 1995, https://www. kommersant(.)ru/doc/112167. Rick Atkinson, “Russian Troops Leave Germany,” Washington Post, September 1, 1994, https://www.washingtonpost.com/archive/politics/1994/09/01/russian-troops-leave-germany/65e3176c-fbe6-47c4-979d-f5fdcb259f6c. John Broder, “Russia Ending Deal on Arms Negotiated by Gore,” New York Times, November 23, 2000, https://www.nytimes.com/2000/11/23/world/ russia-ending-deal-on-arms-negotiated-by-gore.html; [“Boris Yeltsin’s Visit to the U.S.,”] Kommersant, September 30, 1994, https://www.kommersant(. )ru/ doc/91124. Yevgeny Primakov, [A World Without Russia? The Consequences of Political Myopia] (Moscow: Rossiyskaya Gazeta, 2009), https://www.e-reading(. )club/chapter.php/98451/4/ Primakov_-_Mir_bez_Rossii__K_chemu_vedet_politicheskaya_blizorukost%27. html. [“Decree of the President of the Russian Federation #386,”] Kremlin, April 10, 1992, http://kremlin(. )ru/acts/bank/1184; [“Federal Law on the State Policy of the Russian Federation Regarding Compatriots Abroad,”] Kremlin, May 24, 1999, http://www.kremlin(.)ru/acts/bank/13875. Russia 24, [“Lavrov: Historians Will Formulate the ‘Primakov Doctrine’,”] YouTube, October 29, 2014, https://www.youtube.com/watch?v=wLiOIJ0HpR4. [“Presidential Decree on the Approval of the National Security Concept of the Russian Federation,”] Collection of Legislation of the Russian Federation, December 29, 1997, http://www.szrf(.)ru/szrf/doc. phtml?nb=100&issid=1001997052000&docid=1210NationalSecurityConcept. [“TV Address of Russian President Boris Yeltsin on March 24, 1999 Regarding the Threat of NATO Strikes Against Yugoslavia,”] Kommersant, March 25, 1999, https://www.kommersant(.)ru/doc/215535. 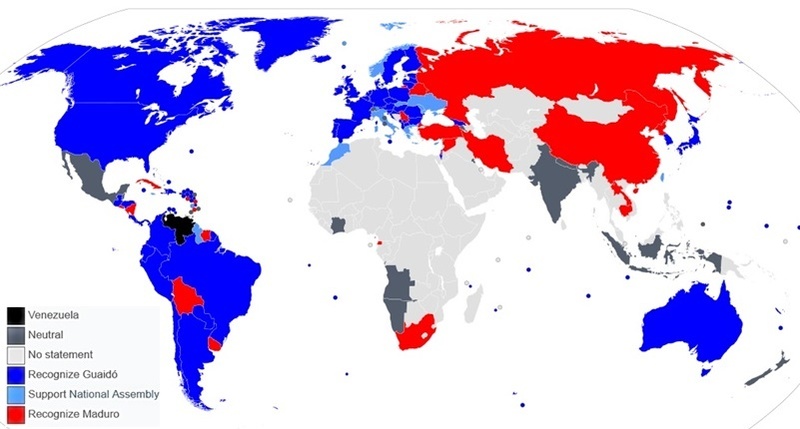 “Founding Act on Mutual Relations, Cooperation, and Security Between NATO and the Russian Federation,” NATO, May 27, 1999, https://www.nato.int/cps/en/ natolive/official_texts_25468.htm. [“On National Security: Address of the Russian President to the Federal Assembly,”] Nezavisimaya Gazeta, July 14, 1996, http://www.rusconstitution(. )ru/ timestream/event/499/; Sergei Kortynov, [Conceptual Foundations of National and International Security] (Moscow: Higher School of Economics, 2007), https://textbooks(.)studio/uchebnik-mejdunarodnie-otnosheniya/poslaniya-natsionalnoy-bezopasnosti-prezidenta.html. Strobe Talbott, “Boris and Bill,” Washington Post, May 26, 2002, https://www. washingtonpost.com/archive/lifestyle/magazine/2002/05/26/boris-and-bill/ ba5a863c-ece7-4e67-bd74-f81c2982c938. [“Academic Hour,”] Kommersant, January 14, 2015, https://www.kommersant(. )ru/ doc/2645293; Chamber of Commerce and Industry of the Russian Federation, [“Yevgeny Primakov’s Presentation at the Meeting of the ‘Mercury Club’,”] YouTube, January 14, 2014, https://www.youtube.com/watch?v=2Yg375FTjYE. [“Man of Life: Yevgeny Primakov,”] Russia-1, https://russia(. )tv/brand/show/ brand_id/4981/. Sebastian Walsh, “A History of Debt Defaults: Russia 1998,” Financial News, July 27, 2011, https://www.fnlondon.com/articles/a-history-of-debt-defaults-russia-1998-20110727.
. Public Russian Television, [“The New FSB Director Vladimir Putin Gives an Interview: 1999,”] December 7, 2017, YouTube, https://youtu.be/JDb57RK5SgI. [“Meeting of the Valdai International Discussion Club,”] Kremlin, October 27, 2016, http://kremlin(. )ru/events/president/news/53151; [“Meeting of the Valdai International Discussion Club,”] Kremlin, October 24, 2014, http://kremlin(. )ru/ events/president/news/46860. Vladimir Putin, [“Russia at the Turn of the Millennium,”] Nezavisimaya Gazeta, December 30, 1999, http://www.ng(.)ru/politics/1999-12-30/4_millenium. html. Roman Anin, “The Secret of the St. Princess Olga,” OCCRP, August 2, 2016, https://www.occrp.org/en/investigations/5523-the-secret-of-the-st-princess-olga. [“Naryshkin Told How He Met Putin,”] RIA Novosti, December 9, 2018, https://ria(.)ru/20181209/1547687041.html. Gevorkyan, Timakova, and Kolesnikov, [First Person: Conversations with Vladimir Putin] http://lib(.)ru/MEMUARY/PUTIN/razgowor.txt. Mosaic, “The Putin Interviews—Oliver Stone Part 1 of 4,” YouTube, June 12, 2017, https://www.youtube.com/watch?v=QvlKSbYkTXI. in Chechnya,” New York Times, April 12, 1995, https://www.nytimes. com/1995/04/12/world/us-sharply-rebukes-russia-for-its-offensive-in-chechnya.html; Vagif Guseynov, [“Evolving Western Positions Regarding the Chechen Crisis,”] Nezavisimaya Gazeta, February 29, 2000, http://www.ng(. )ru/ specfile/2000-02-29/15_evolution.html. Russia 24, [“Putin: Film by Andrey Kardashev. Full Video,”] YouTube, March 24, 2018, https://www.youtube.com/watch?v=y9Pu0yrOwKI; [“Putin: Russia Has Maintained Sovereignty and Made Breakthroughs in Important Areas,”] RIA Novosti, December 19, 2017, https://ria(. )ru/20171219/1511255375.html; [“2013: Vladimir Putin’s Red Lines,”] Rossiyskaya Gazeta, September 26, 2013, https:// rg(. )ru/2013/09/26/valdai.html; [“The Best Moments of Putin’s Interview,”] Argumenty i Fakty, March 14, 2018, http://www.aif(. )ru/politics/russia/ne_imeyu_ prava_slabost_proyavlyat_samye_yarkie_momenty_iz_intervyu_putina; DenTV, [“Alexander Dugin: Russians Are on the Verge of Losing Their Identity,”] YouTube, March 6, 2018, https://www.youtube.com/watch?v=q7dzL3IodxQ. [“Presidential Decree on the National Security Concept of the Russian Federation,”] Kremlin, January 10, 2000, http://kremlin(.)ru/acts/bank/14927. “Russia Paid Off IMF Debts,” UPI, February 1, 2005, https://www.upi(. )com/ Russia-has-paid-off-IMF-debts/66111107283700/; “Russia Pays Off Paris Club Debts,” BBC, August 25, 2006, http://news.bbc.co.uk/2/hi/business/5271122. stm; [“Why Russia Had to Pay the Soviet Debts,”] TASS, August 21, 2017, https://tass(.)ru/ekonomika/4033459. [“Putin Talked About the IMF Debts of the Former Soviet Republics That Russia Paid Off,”] Lenta, June 13, 2017, https://lenta(.)ru/news/2017/06/13/debtimf/. The Guardian, May 31, 2005, https://www.theguardian.com/world/2005/ may/31/russia; Marshall Goldman, “Putin and the Oligarchs,” Foreign Affairs, November/December 2004, https://www.foreignaffairs.com/articles/russia-fsu/2004-11-01/putin-and-oligarchs. [“Putin Cancelled the Elections of Governors,”] Korrespondent, December 12, 2004, https://korrespondent(. )net/world/109086-putin-otmenil-vybory-gubernatorov; Jeremy Bransten, “Russia: Putin Signs Bill Eliminating Direct Elections of Governors,” RFE/RL, December 13, 2004, https://www.rferl. org/a/1056377.html. [“On the Eve of Single Economic Space: Kuchma Against the Diplomats,”] Ukrayinska Pravda, September 17, 2003, https://www.pravda.com(. )ua/rus/ news/2003/09/17/4374367. Statement by President of Georgia Eduard Shevardnadze,” NATO, November 22, 2002, https://www.nato.int/docu/speech/2002/s021122h.htm; Jean-Christophe Peuch, “Georgia: Shevardnadze Officially Requests Invitation to Join NATO,” RFE/RL, November 22, 2002, https://www.rferl.org/a/1101463.html. Russia 24, [“Putin: Film by Andrey Kardashev. Full Video,”] YouTube, March 24, 2018, https://www.youtube.com/watch?v=y9Pu0yrOwKI; [“Putin Called External Control Humiliating for Ukraine,”] Lenta, August 17, 2015, https://lenta(.)ru/news/2015/08/17/putinobukraine/. [“Putin Said That the Authorities Will Not Allow ‘Color Revolutions’ in Russia,”] RIA Novosti, April 12, 2017, https://ria(. )ru/20170412/1492073208.html; Darya Korsunskaya, “Putin Says Russia Must Prevent ‘Color Revolution’,” Reuters, November 20, 2014, https://www.reuters.com/article/us-russia-putin-security-idUSKCN0J41J620141120. Glenn Kessler, “NATO Seeks to Soothe Russia,” Washington Post, April 3, 2004, https://www.washingtonpost.com/archive/politics/2004/04/03/nato-seeks-to-soothe-russia/2c46ac29-1b42-4121-8fc8-3fdf8302ee40; Seth Mydans, “Putin Doubts Expanded NATO Meets New Threats,” New York Times, April 9, 2004, https://www.nytimes.com/2004/04/09/world/putin-doubts-expanded-nato-meets-new-threats.html; [“Interview with Wall Street Journal,”] Kremlin, February 11, 2002, http://kremlin(.)ru/events/president/transcripts/21498. Vladimir Bogdanov, [“Growing Irritation in Moscow,”] Rossiyskaya Gazeta, March 30, 2004, https://rg(.)ru/2004/03/30/kreml.html. [“The Common Interests of Fighting Global Threats Outweigh Any Differences Between Russia and the United States,”] RIA Novosti, February 13, 2004, https://ria(.)ru/20040213/526860.html. [“Putin Promises Substantive Support to Abkhazia and South Ossetia,”] Izvestia, April 3, 2008, https://iz(.)ru/news/422147#ixzz3aV2E3Gyz. [“Putin: Russia, India, and China Can Prevent the Creation of a ‘Unipolar World’,”] Lenta, December 4, 2004, https://lenta(.)ru/news/2004/12/04/putin. Isabel Gorst and Neil Buckley, “Medvedev and Putin Clash Over Libya,” Financial Times, March 21, 2011, https://www.ft.com/content/2e62b08e-53d2-11e0-a01c-00144feab49a. Russia-1, [“Putin Against Killing of Gaddafi,”] YouTube, April 26, 2011, https://www.youtube.com/watch?v=OFBOxGdrXR8. Alexei Anishchuk, “Gaddafi Fall Cost Russia Tens of Billions in Arms Deals,” Reuters, November 2, 2011, https://www.reuters.com/article/russia-libya-arms-idUSL5E7M221H20111102. Tom O’Connor, “Russia Says U.S. and Allies Lied When They Attacked Libya, Now It’s Ready to Get Involved,” Newsweek, November 13, 2011, https://www. newsweek.com/russia-says-us-allies-lied-libya-ready-help-1213872. Peter Ferdinand, “The Positions of Russia and China at the UN Security Council in the Light of Recent Crises,” European Parliament, March 1, 2013, http://www.europarl.europa.eu/RegData/etudes/note/join/2013/433800/ EXPO-SEDE_NT%282013%29433800_EN.pdf. [“Patrushev Talks About Western Actions Against Russia,”] Pravda, May 5, 2005, https://www.pravda(. )ru/news/world/12-05-2005/56630-patrushev_zapad_ revoljucija_sng_lukashenko_belorussija_demping-0/. [“Putin Will ‘Order Music’ Himself,”] Polit, July 20, 2005, http://www.polit(.)ru/news/2005/07/20/musicputt/. Katherin Machalek, “Factsheet: Russia’s NGO Laws,” Freedom House, https://freedomhouse.org/sites/default/files/Fact%20Sheet_0.pdf. [“U.S. Will Teach Foreign Journalists How to Talk About Democracy,”] RBC, December 14, 2005, https://www.rbc(. )ru/ politics/14/12/2005/5703bb819a7947afa08c909d; Curt Tarnoff, “U.S. Assistance to the Former Soviet Union,” Congressional Research Service, April 14, 2005, https://www.everycrsreport.com/files/20050414_ RL32866_4df4f774f1d7136d7c55b5330924fb4f2a63a2d2.pdf. “Yukos: Russia Hits Back at U.S.,” CNN, November 1, 2003, http://www.cnn.com/2003/WORLD/europe/11/01/yukos/index.html. Luke Harding and Ian Traynor, “Obama Abandons Missile Defence Shield in Europe,” The Guardian, September 17, 2009, https://www.theguardian.com/ world/2009/sep/17/missile-defence-shield-barack-obama. World Bank, Country and Lending Groups, 2015, https://web.archive.org/ web/20140702131322/http://data.worldbank.org/about/country-and-lending-groups. [“Putin Explained Troop Deployment to Syria,”] Moskovskij Komsomolets, September 30, 2015, https://www.mk(.)ru/politics/2015/09/30/putin-obyasnil-vvedenie-rossiyskikh-voysk-v-siriyu.html. [“Peskov: Russia Will Be the Only Country Operating in Syria on Legitimate Basis,”] Gordon, September 30, 2015, https://gordonua(. )com/news/worldnews/ peskov-rossiya-budet-edinstvennoy-stranoy-osushchestvlyayushchey-operacii-v-sirii-na-legitimnoy-osnove-100135.html. RT, [“Putin: The Bear Will Never Be Left Alone,”] YouTube, December 18, 2014, https://www.youtube.com/watch?v=8cwh5be7Jts. NTV, [“Vladimir Putin’s Press Conference 2018,”] YouTube, December 20, 2018, https://www.youtube.com/watch?v=Ea1xHJhQl50. [“Presidential Decree #683: ‘On the National Security Strategy of the Russian Federation’,”] Rossiyskaya Gazeta, December 31, 2015, https://rg(. )ru/2015/12/31/ nac-bezopasnost-site-dok.html. “‘Take A Pill’: Putin Accuses U.S. Of Hysteria, Destabilizing The World,” RFE/ RL, June 2, 2017, https://www.rferl.org/a/st-pete-forum-putin-accuses-us-destabilizing-international-arena/28525266.html; Russia-1, [“Putin’s Best Moments with NBC’s Megyn Kelly,”] YouTube, June 4, 2017, https://www.youtube. com/watch?v=12s_n6F2ZEQ. [“Putin Believes That Anti-Russian Rhetoric May Decline in the U.S. After 2020,”] TASS, October 18, 2018, https://tass(.)ru/politika/5691040. RIA Novosti, [“Putin About ‘Magnitsky Act’,”] YouTube, December 26, 2012, https://www.youtube.com/watch?v=V4TTRnZB9cI. RT, [“Putin Responded to Pompeo’s Ultimatum on the INF Treaty,”] YouTube, December 5, 2018, https://www.youtube.com/watch?v=ohONm97wt20. [“Putin: Most Citizens Do Not Have Influence Over Power in Democratic Countries,”] RIA Novosti, October 27, 2016, https://ria(.) ru/20161027/1480141794.html; NTV, [“Vladimir Putin’s Press Conference 2018,”] YouTube, https://www.youtube.com/watch?v=Ea1xHJhQl50. [“Putin: Most Citizens Do Not Have Influence Over Power in Democratic Countries,”] RIA Novosti, October 27, 2016, https://ria(.)ru/20161027/1480141794.html. Putin, “Speech and Following Discussion at the Munich Security Conference,” February 10, 2007, http://en.kremlin(.)ru/events/president/transcripts/24034. Putin, “Address by the President of the Russian Federation,” March 18, 2014, http://en.kremlin(.)ru/events/president/news/20603. [“No One Listened to Us Then. So Listen Now,”] BBC, March 1, 2018, https://www.bbc.com/russian/news-43240396. On January 22nd I cross posted a Rick Joyner video and a part one article on “Second American Revolutionary/Civil War”. In this post I’m sharing the Joyner/MorningStar articles for parts two – five. Heaven’s perspective of war can be very different than our human perspective. We tend to see the battles, which side prevails, and then which side exerts its will over the other. Heaven tends to look at them as how justice or injustice prevails. War is an ultimate evil, but war is inevitable until the end of this age, just as we see them right to the end of the Book of Revelation. There are times when an even worse evil would prevail without war, and so there are righteous wars. In these it would be unrighteous, and even evil, not to fight for what is right. However, in most wars there is a mixture of good and evil intent, prosecution of the war, and outcomes. In this age, there will be a mixture of good and evil in virtually everything. Because of this, if we wait to have perfect motives or perfect conditions, we will likely not do anything. The best solution to an issue can be just a little better than the worst solution. It takes wisdom to know what to do, but it often takes even more to know when to do it. I fully understand that without having the experience that I had in the dream, you are not likely to have the level of conviction that I might have about some of these things. Some you may agree with inherently, and some you may disagree with. However, because of the nature of this dream, I must be bolder than I’ve ever been about some things I am going to share. The first part of this dream I was given was for understanding the strategy that will be successful in this war. There will be champions raised up that will go out to attack the specific evil strongholds in our nation. These evils were things like bigotry, greed, selfish ambition, hatred, rebellion, pride, etc. In the dream, all of these evils were in trees, which speaks of them having roots and branches. To defeat them, one must not waste time flailing at the branches, but rather put an ax to the root of the tree. America is not the kingdom of God or the New Jerusalem. I have searched our history for evidence that we had a special covenant with God, and I have not found it. Men have made covenants with God for the nation, but that is not the biblical criteria for a covenant God is obligated to, even if made by a leader of a nation. Every covenant of God originated with God not man, and there is a clear and supernatural demonstration that He made the covenant. I may have missed it, but I could not find this in our national history. That being said, there is much evidence that America was dedicated to God. Dedications can originate with man, and everything dedicated to God is holy, or sanctified. There are special benefits and judgments that come with a dedication. The favor of God is worth more than any earthly treasure or other resource. However, because everything dedicated to God is holy, a nation dedicated to God cannot do some things other nations may be able to get away with. Purpose is the greatest favor of God that we have received for this dedication. We were given a purpose to be a nation that demonstrated the liberty and justice that all people were created to have. It is written that “where the Spirit of The Lord is there is liberty” (see II Corinthians 3:17). This is why The Tree of the Knowledge of Good and Evil was put in the Garden. There could be no true obedience unless there was the freedom to disobey. Freedom and free will is at the core of what we were created to be. Our founding documents are not Scripture, but they were inspired by God in order to reveal and lead us to our destiny. It is because we have this calling that when we drift from it, troubles come. Having a clear vision of our destiny and getting back on the path to fulfilling it is crucial to our continued existence. Our discord increases the more we deviate from our purpose. As discussed, one of our basic purposes as a nation was to establish a place where it is understood that “all men are created equal” and also practiced. In heaven, this, not independence, was the main issue with the Revolutionary War. Because our main purpose was compromised and hypocritically disregarded after the Revolutionary War, the Civil War became inevitable. If the American Republic had really believed that all men were created equal, then slavery, and even discrimination based on race, could not have remained possible. The Civil War may have eradicated slavery, at least in its most diabolical form, but it did not go as far as establishing that “all men are created equal.” This is just one factor in our mandate that has yet to be fulfilled. We can be thankful for the progress that has been made in eradicating discrimination in America, and there has been notable progress, but it is still far from the place we are called to be. We have now come to the point where increasing conflict is inevitable until we recover a clear vision of the mandate we were given as a nation and resolve to fully obey it. What I was shown in my dream was specifically for “The American Republic,” but I was also shown that many of the same battles we will be fighting will also be common to many nations. Basically, these battles in the nations are for determining whether they will be a “sheep” or a “goat” nation. The Great Commission was to disciple nations, not just individuals, not just teaching them to believe all that He commanded, but also to obey all that He commanded. The Reformation was a major step forward in recovering biblical truth, but its emphasis was more on believing the right things than actually doing them. All nations have fallen short of their purpose, including Israel, as the Scriptures make clear. One reason the nations have fallen short is because there is so little demonstration of what actual obedience to the truth looks like by the church. This is why “judgment begins with the household of God” (see I Peter 4:17). Most of us have witnessed spiritual battles that resulted in everything from church splits to divorces, and God was on both sides. God hates divorce, and He hates war. He usually has sons and daughters on both sides, and in many ways He can be on both sides. He’s not confused about the issues, but He is for people more than politics. God is not a Democrat or a Republican, a liberal or a conservative. We can be right in our political beliefs, but be wrong in spirit. We can likewise be wrong in our politics but have a right spirit of love, faith, and humility that pleases The Lord more than those who have right politics. This is why, to the confusion of many historians, there can be evidence of divine favor on both sides during a war. Abraham Lincoln discerned that our Civil War was God’s judgment on both sides. This might explain why the Union was obviously on the right side of some of the crucial issues being fought over, but the Southern armies experienced some of the greatest revivals in American history during the war. Perhaps The Lord moved so mightily upon the Southern armies because “where sin abounds grace does that much more abound” (see Romans 5:20), and He was seeking to change their hearts on the issues. Perhaps it was because it is often true that those who can be right on issues are wrong in spirit, and God will always resist the proud and give His grace to the humble. It was likely a combination of both. The point is that we like to have all issues neatly in black and white, but human issues are far more complicated than that. We are in desperate need of heaven’s perspective. The higher the place that we can see from, the more sense it all makes. In the Revolutionary and Civil Wars, both sides were fighting for parts of the divine mandate. It was the arrogance of the victors in both of these wars that blinded them to just and righteous issues for which the other side was fighting. Neither side was totally right or wrong, but the victors disregarded the consideration that the losers might have been right about some of the issues. Such is human politics. Since the victors always write the histories of such conflicts, the just issues on the losing side are often buried after the war. We can bury them as deep as we want, but when they are a divine mandate they will not go away. Rather, they will rise again and be in our face until they are resolved by our obeying them. It is also easy to see how these same principles might apply to all human relationships. We can win an argument because we are mostly right, but be wrong about some of it. Those issues will very likely surface again later, and often as a bigger problem. The revelation of the great conflict of our times includes principles that may illuminate the basis for our conflict in other more personal relationships, such as our families, jobs, or neighborhoods. We cannot expect to resolve the great national and international conflicts if we cannot solve them in ourselves, our families, or in the church. When I spoke to a number of senators and congressmen in Washington a few years ago, entreating them to show courage, one of them took me aside and said, “You would see a lot more courage in Washington if we saw any in the church.” He was right. It’s been said that “Courage is the first principle of leadership, because without it nothing else will stand.” We have come to a time when courage is rare, and that makes it even more valuable. Perhaps this is why the cowards are the first to get thrown into the lake of fire at the end of the Book of Revelation. We may think that love and faith are more important, and they are, but courage is the evidence that one has love and faith. As we are told in I Corinthians 13:8, “Love never fails.” This could have been interpreted as “Love never quits.” We will quit for any other reason but love. This is why the foundation of those who will be on the winning side will be love for their country and for their countrymen. However, most of all it will be love for God who has given us something so wonderful, even if it yet has flaws. Wars have been fought for different reasons. There have been religious, political, and economic wars. Some have been just for conquest. Some have been fought because one monarch was insulted by another, which is why Napoleon invaded Russia. Many have been fought over combinations of the above. Some of the most ugly and devastating of all have been racist wars. Every war is the result of some failure in human relations. Potentially great and devastating wars have also been avoided by remarkable statesmanship. The Lord has a special heart and place for the peacemakers. These should be esteemed more in our history than those successful at war, but they are not. Even so, as we are told in Ecclesiastes 3, there is a time for war and a time for peace. If it is time for war, then those who do not fight are the ones out of step with the times. As we see in Scripture, there will be war until the end of this age. It is right to seek peaceful conclusions to our disputes, until war begins. Then we must fight, and we must fight to win. If we are going to win from heaven’s perspective, we must also fight the right way. Some of the most touching stories of war are things like the troops on both sides in our American Civil War and in World War I, singing Christmas carols to their enemies in the trenches. It brought a poignant realization that brothers in Christ were facing each other, and the next day would try to kill each other. How could this be right? War is an ultimate human failure. War is one of the devil’s biggest victories. His intent is to kill and destroy, and nothing accomplishes this in a bigger way than war. So why don’t we refuse to fight them? Because the devil, and those controlled by him, will not. To refuse to fight in an inevitable or right war is not choosing to do what is right. Rather, it is to submit to evil. There are righteous wars. When it is right and time to fight, we will be in rebellion if we do not do our part. Even The Lord says repeatedly in Scripture that He, our Leader, is a Warrior. Israel left Egypt as “a great mixed multitude,” or a mob, but before they even got to the Red Sea they were “marching in martial array,” or military order. Presently, the body of Christ is one big mob, with some groupings and associations but lacking in overall definition and discipline. This will soon change for the remnant that is left. In every civil war, Christian leaders from both sides have claimed that theirs was the right side. This can be confusing. We must resolve to be sure we are fighting on the right side and for the right cause. When this is established, the most merciful way is to fight to win decisively and as quickly as possible. Harry Truman was right when he said that “Most people are defeated by their secondary successes.” This means that they got distracted from their ultimate objective after achieving lesser ones. There are many examples of this in history, and Truman was likely correct to say this happens to “most people.” It was true in our Revolutionary and Civil Wars. How do we avoid this deadly trap? We must determine now what the ultimate objectives are—anything less than these would be a defeat. I have an opinion of what ultimate victory in the unfolding Revolutionary/Civil War looks like, but I don’t want to share it and I don’t even want to have it. What we need, and what I’m begging for, is heaven’s perspective on this. My dream on December 14, 2018 was just a small beginning of this for me. It does not matter how mature we are in Christ or how successful we have been as a steward of His mysteries—it is a terrible presumption to think that He is just like us and that His opinions are the same as ours. I am a religious conservative, and I try to keep in mind that it was the religious conservatives that were the worst enemies of Christ when He walked the earth. Why? Again, we can be right in our politics, our policies, and our beliefs, but have pride that is more deadly than the evil we are fighting. Pride caused the first fall and virtually every fall since. We can be right but not be righteous. For winning the present war, it is crucial to not just fight for what is right, but to do it in the right spirit. We must fight for right and we must do it right. In the Revolutionary War, the “Patriots” who wanted independence were about 30% of the population. The “Loyalists” who wanted to remain British subjects were also about 30%. The other 40% were undecided, or tended to switch sides according to who was winning. Today, we have about 30% who are liberal, 30% conservative, and the 40% that are still undecided or wavering. Soon all will have to choose a side. Now is the time to resolve what we believe in. The dream began with a long line of people waiting to tee off at a golf course. After each one teed off, they were told about the enemy they were to look for to destroy. This enemy was in the trees along the fairway. I was waiting in line for my turn when an angel came up to me and said I had a different assignment. That’s when I was taken to the device that revealed the history of the American Republic from heaven’s perspective. Golf, like many games, can mirror an aspect of life. The goal is to get the ball in a hole that has a flag, or standard, over it. Each hole on the course is different from the others. No two shots will be the same, so you must judge several conditions on each shot, such as distance to the hole, wind, and elevation. You may know exactly what you should do, but actually doing it the way you want is another matter. To be successful, you need to stay in the fairway, or let’s say “the way.” If you go too far to either the right or left, you will go out of bounds and that brings a serious penalty. I don’t want to bore you with a golf lesson here, but having played golf for many years, this part of the dream made perfect sense to me as a strategy for winning the Revolutionary/Civil War. To some degree, if we are going to understand prophetic symbolism, we must learn that The Lord likes to use puns. We are told in Psalm 2:4 that He “sits in the heavens and laughs.” This may be because He thinks they are funny, but they can also powerfully convey understanding. In this dream, those who were teeing off were going to find the enemy they were assigned to destroy. This is insight about what “tees us off” will be what we are called to fight. For example, those who are the most disturbed and agitated by human trafficking should take that as a sign that they are called to fight this enemy. For others, it could be things like racism, or the sowing of immorality in school curriculum. These are not random provocations intended to irritate us; they are calls to action. We must all consider how we can be a part of fighting what provokes us the most and what Scripture defines as evil. Again, for Christians the Scriptures are clear that our battle is never against people, but rather against the demonic forces that are manifested through ideologies and deceptions that bind, and ultimately, destroy them. Our victory is not to kill and wound, but to heal and lead people to the path of life. We are not fighting to conquer people or to just win the argument, but we fight to establish the truth that sets people free. How does that work when a spiritual or philosophical war breaks out into violence? These are the kinds of issues we need to settle in our hearts now, because the confused are almost certain to be casualties in what is unfolding. We may also think that if God hates war then His people should stay out of the conflict. God does hate war, but as we touched on before, He is declared to be a warrior in a number of Scriptures. No doubt that if we followed Him more fully, our disputes would not come to war. However, as we are told in Ecclesiastes 3, there is a time for war. There are times when war is inevitable, and times when it is right to fight. What I was shown in the dream is that this Second American Revolutionary/Civil War is inevitable, it is right, and it will be successful. At this writing, I do not know now what or how it happened, but in this dream, I knew that somehow we had just crossed a line that made this second Revolutionary/Civil War inevitable. There will not be a peaceful solution to the conflicts that have arisen in our country. Even so, I will continually pray that this be won decisively and with the fewest possible casualties and the least damage as possible. Why this is called a Revolutionary and Civil War is important. Much of what we need to understand the great battles of our times lies in understanding these conflicts because so many of them were fought over in these wars, but not settled. Also, wars come in many forms. The Cold War brought about the greatest geopolitical change in history, but it was not fought with traditional weapons, but rather with banks and currencies. It was an economic war more than a political or military one. 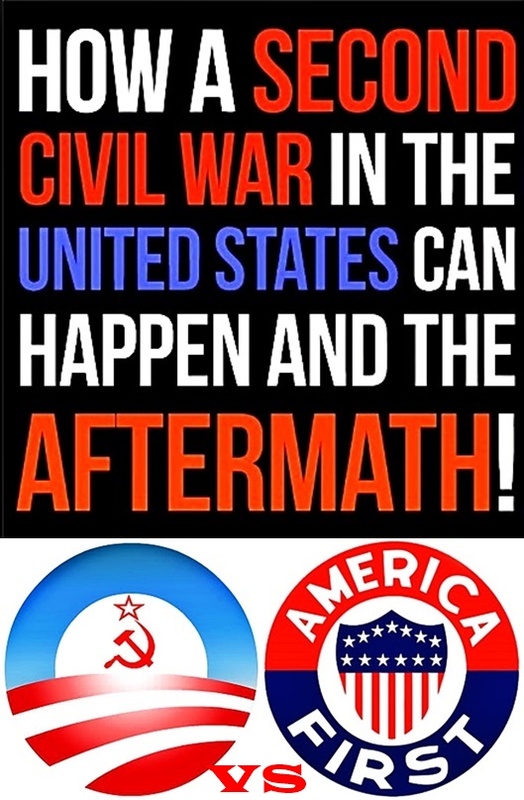 Just as in the Revolutionary and Civil Wars, many of the issues that the Cold War was fought over were not decisively defeated, and now they have risen to face us again. We must not forget that the most powerful weapons of all are the “divinely powerful weapons” that we have been entrusted with. Truth articulated under the anointing is more powerful than any bomb. Though there will be physical conflict in what is now unfolding, the most important issues will be the spiritual and moral ones, especially our devotion to liberty for all—that everyone be treated equally and fairly under the law and with opportunity. Finding and fulfilling your purpose in Christ is the greatest adventure you can have in this life. MorningStar University exists for the purpose of helping His disciples find and prepare for that purpose. Having been called a movement of “thinking prophets,” MSU is designed to equip high-impact Christians in every major sphere of influence. MorningStar University is accredited through AICCS and offers a Certificate, Associate’s Degree, Bachelor’s Degree, and a Master’s Degree in Leadership. MSU is based at our headquarters near Charlotte, North Carolina. Tuition is affordable and housing is available. Click Here for more information about MSU or call 803-547-8494. On a personal level I have felt for some time American Left agitation against Conservatives not willing to toss out traditional American-Christian values would inevitably lead to a second American Civil War. Ergo, after receiving my alert from Rick Joyner’s MorningStar Ministries under the title “The Second American Revolutionary/Civil War – Part 1,” my interests were instantly piqued. To those of you unaware of who Rick Joyner is, he is a Bible-Believing minister with an emphasis on Prophetic Ministry. Now I realize many Mainline Christians view ministries that call themselves “Prophetic” are often viewed as a cult or heretic. There is good reason for that. Too many propagating the prophetic are flimflam individuals painting themselves as Christians yet are more interested in self-aggrandized wealth on the backs of the honest yet gullible attracted to experiencing the supernatural with the hope it is a move of God. If the prophetic lines up with the Bible, it is legit. If the prophetic is extra-Biblical or derisive of the Bible, it is illegitimate, deceptive and in danger of being under demonic/devilish influence. Then there are critics of the Prophetic who examine the foretelling nature to evaluate a percentage of accuracy. Too often this perspective is too ridged ignoring a symbolic picture some form of type or shadow of a difficult to interpret potentiality. In my opinion, Rick Joyner is heavily in the symbolic picture prophetic. Part of the issue with the symbolic picture prophetic is pinning down a timeframe is difficult and might not be realized until some form of experiential occurrence. In this sense the prophetic is more an “aha moment” than a predictive point in time. In a dream, Rick Joyner had a symbolic picture of prophetic history (perhaps in a panoramic view) pointing to Civil War. I look forward to part two to capture a more concrete perspective of Joyner’s dream. A friend sent a Facebook private message pertaining to a so-called 28th Amendment to the Constitution. The theme of the proposal is to place restraints on Congress to insure every law passed for American citizens must also apply to members of Congress. AND Congress members will not be entitled to any special privileges not available to American citizens. My suspicions arose with the message sentiment encouraged readers to pass it on if you agree. BUT WAIT! I just realized I was sent a 28th Amendment back July 2017. I posted my thoughts back then under the title, “Faux 28th Amendment, Yet Still Need Convention”. You can compare my thoughts back then (which I believe are similar) to today’s post surrounding a 28th Amendment Chain Email. According to Truth or Fiction fact-finding there is absolutely no truth to the Chain Email. HOWEVER, after reading the chain email you might want to forward or share the Amendment info to your Representative and two Senators in Congress on a Federal level. 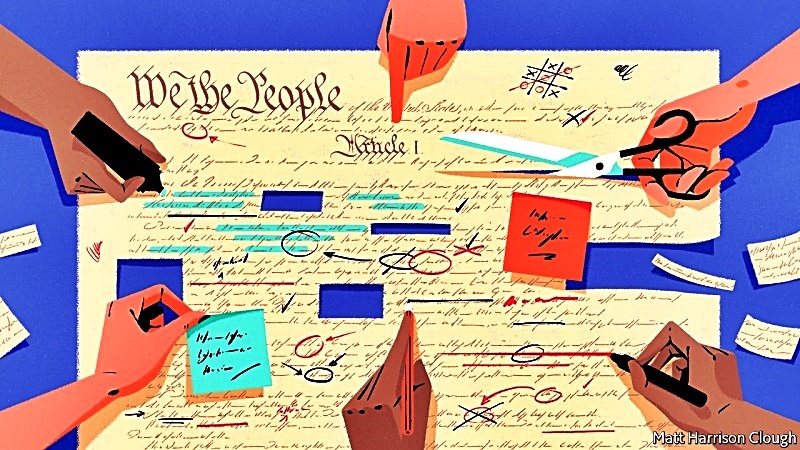 The Chain Email 28th Amendment is quite worthy as an actual proposal to be considered by Congress or the various State legislatures who call for a Constitutional Amendment Convention. 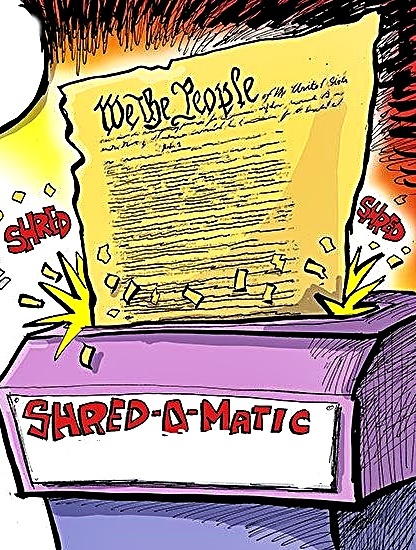 Ergo, if inspired, send the Amendment info to your local State legislators for consideration on the Establishment of the dreaded Constitutional Convention of States to bypass the gridlocked lobbyist-dominated Federal Congress. Method ONE: Proposed Amendment ratified by 2/3 of each House of Congress, then the proposed Amendment sent to each State Congress in which case if ¾ of the States ratify the proposed Amendment, it becomes law. 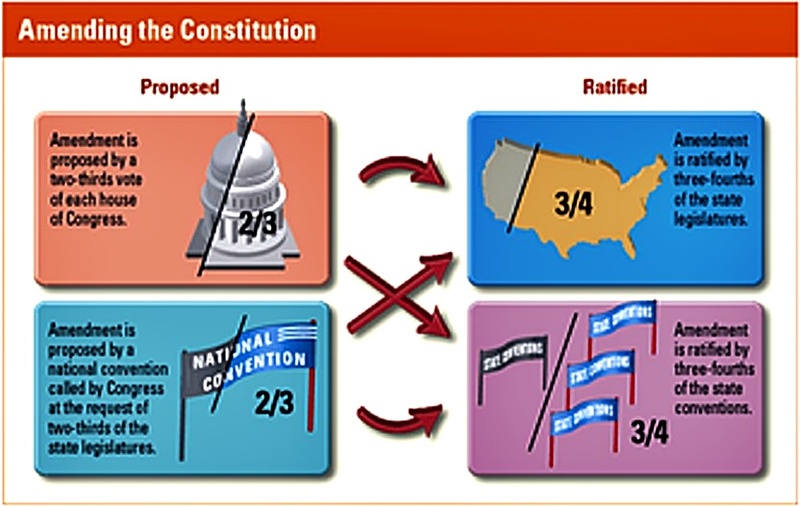 Method TWO: 2/3 of the several States call a Convention on a proposed Amendment or proposing of Amendments plural, then if ¾ of the several States approve the Amendment or any Amendments plural, it or they become law. The biggest concern about a Constitutional Convention is the representative delegates from each State may go rogue and re-write the entire Constitution. In which case a battle of ideologies takes place and God only knows if it actually results in Amendments sent to State Congresses to decide on ratification or an impasse resulting in a Civil War. Due to the potentiality of an anti-Founding Father sentiment among delegates from several States, I have not looked favorably on the calling of a Constitutional Convention. HOWEVER TODAY, I sense ideological gridlock among American voters between proponents desiring more clarity of the Founding Fathers’ vision and proponents of a transformed America which Secular Humanist moral relativity becomes a Globalist-Multiculturalist foundation for a rule of law. Inherent in that gridlock of vision are the seeds of Civil War in which winners determine America’s Socio-Political moral-grounded future. If a Convention can hearken back in a spirit of compromise that both Left-Right ideologies can live with as performed by the Constitutional Convention that gave America it’s present Constitution, then and only then can a Civil War be avoided. The current struggle between President Trump standing with Conservative principles on the issue of Border Security/National Sovereignty and Open Borders/Globalist-Multiculturalists is a mere symptom of how ideological gridlock could develop into violent confrontations between supporters of each divergent agenda. 4 These are the two olive trees and the two lampstands standing before the [a]God of the earth. 5 And if anyone wants to harm them, fire proceeds from their mouth and devours their enemies. And if anyone wants to harm them, he must be killed in this manner. 6 These have power to shut heaven, so that no rain falls in the days of their prophecy; and they have power over waters to turn them to blood, and to strike the earth with all plagues, as often as they desire. 7 When they finish their testimony, the beast that ascends out of the bottomless pit will make war against them, overcome them, and kill them. 8 And their dead bodies will lie in the street of the great city which spiritually is called Sodom and Egypt, where also [b]our Lord was crucified. 9 Then those from the peoples, tribes, tongues, and nations [c]will see their dead bodies three-and-a-half days, and not allow their dead bodies to be put into graves. 10 And those who dwell on the earth will rejoice over them, make merry, and send gifts to one another, because these two prophets tormented those who dwell on the earth. 11 Now after the three-and-a-half days the breath of life from God entered them, and they stood on their feet, and great fear fell on those who saw them. 12 And [d]they heard a loud voice from heaven saying to them, “Come up here.” And they ascended to heaven in a cloud, and their enemies saw them. 13 In the same hour there was a great earthquake, and a tenth of the city fell. In the earthquake seven thousand people were killed, and the rest were afraid and gave glory to the God of heaven. 11 Then I saw another beast coming up out of the earth, and he had two horns like a lamb and spoke like a dragon. 12 And he exercises all the authority of the first beast in his presence, and causes the earth and those who dwell in it to worship the first beast, whose deadly wound was healed. 13 He performs great signs, so that he even makes fire come down from heaven on the earth in the sight of men. 14 And he deceives [a]those who dwell on the earth by those signs which he was granted to do in the sight of the beast, telling those who dwell on the earth to make an image to the beast who was wounded by the sword and lived. 15 He was granted power to give breath to the image of the beast, that the image of the beast should both speak and cause as many as would not worship the image of the beast to be killed. 16 He causes all, both small and great, rich and poor, free and slave, to receive a mark on their right hand or on their foreheads, 17 and that no one may buy or sell except one who has [b]the mark or the name of the beast, or the number of his name. 7 But the angel said to me, “Why did you marvel? I will tell you the [a]mystery of the woman and of the beast that carries her, which has the seven heads and the ten horns. 8 The beast that you saw was, and is not, and will ascend out of the bottomless pit and go to [b]perdition. And those who dwell on the earth will marvel, whose names are not written in the Book of Life from the foundation of the world, when they see the beast that was, and is not, and [c]yet is. 9 “Here is the mind which has wisdom: The seven heads are seven mountains on which the woman sits. 10 There are also seven kings. Five have fallen, one is, and the other has not yet come. And when he comes, he must continue a short time. 11 The beast that was, and is not, is himself also the eighth, and is of the seven, and is going to [d]perdition. It would be irresponsible of me to inform you the above described socio-political disaster of looming godless victories may actually coincide with a potential American Civil War or even to stipulate today’s political gridlock suggests the doom of the Founding Fathers’ political experiment of Freedom and Liberty. BUT in mind, the scenario does possibly exist. If the above timing is imminent, I have GOOD NEWS! 14 Then Death and Hades were cast into the lake of fire. This is the second [a]death. 15 And anyone not found written in the Book of Life was cast into the lake of fire. 22 But I saw no temple in it, for the Lord God Almighty and the Lamb are its temple. 23 The city had no need of the sun or of the moon to shine [a]in it, for the [b]glory of God illuminated it. The Lamb is its light. 24 And the nations [c]of those who are saved shall walk in its light, and the kings of the earth bring their glory and honor [d]into it. 25 Its gates shall not be shut at all by day (there shall be no night there). 26 And they shall bring the glory and the honor of the nations into [e]it. 27 But there shall by no means enter it anything [f]that defiles, or causes an abomination or a lie, but only those who are written in the Lamb’s Book of Life. 6 Then he said to me, “These words are faithful and true.” And the Lord God of the [a]holy prophets sent His angel to show His servants the things which must shortly take place. Well, after relaying my thoughts on the 28th Amendment Chain Email, my encouragement to promote an Amendment proposal, the likelihood such an amendment proposal would only succeed via a States summoned Constitutional Convention and the potential hazards involved in said Convention; below is the version (paragraph edited) of the Chain Email sent to me followed by the debunking as NOT TRUE by the fact-checkers at Truth or Fiction below that. Whew! I know, it’s a long post. But I think you might be interested. Children of Congress members do not have to pay back their college student loans. Staffers of Congress family members are also exempt from having to pay back student loans. Members of Congress can retire at full pay after only one term. Members of Congress have exempted themselves from many of the laws they have passed, under which ordinary citizens must live. For example, they are exempt from any fear of prosecution for sexual harassment. And as the latest example, they have exempted themselves from Healthcare Reform, in all of its aspects. We must not tolerate an elite class of such people, elected as public servants and then putting themselves above the law. I truly don’t care if they are Democrat, Republican, Independent, or whatever. The self-serving must stop. Governors of 35 states have filed suit against the Federal Government for imposing unlawful burdens upon their states. It only takes 38 (of the 50) States to convene a Constitutional Convention. If each person that receives this will forward it on to 20 people, in three days most people in The United States of America will have the message. No Tenure / No Pension. A Congressman/woman collects a salary while in office and receives no pay when they’re out of office. And, no more perks go with them. Congress must purchase their own retirement plan, just as ALL Americans do. Congress must equally abide by all laws they impose on the American people (i.e. NO MORE INSIDER TRADING!!!). All contracts with past and present Congressmen/women are void. The American people did not make this contract with Congressmen/women. Congress made all these contracts by and for themselves. Serving in Congress is an honor and privilege NOT a career. The Founding Fathers envisioned citizen legislators should serve their term(s), then go home and go back to work … not get all kinds of freebies. Just hold your finger down then hit forward and send it to everyone you know. Let’s help get the country straightened out. A Proposed 28th Amendment That Says ‘Congress Will Make No Laws That Does Not Apply to Them’? A rumor that has been around for years periodically finds new life in email forwards and on social media — but it’s still not true. More than half of the United States has signed on to a proposed “28th amendment” to the Constitution. The email then asks readers to forward the message, a demand that should always spur further fact-checking. There have been at least 26 federal lawsuits seeking to overturn the health reform law. In the six biggest decisions, three panels of judges have supported the constitutionality of the law, and three have ruled against it — with one major appellate decision expected any day from an appeals court in Richmond, Va. Both sides pledge to take the issue all the way to the Supreme Court, which may decide to take up the case as early as this fall. The 11th Circuit Court sided with 26 states — mostly led by conservative governors and attorneys general — who are asking for the law to be blocked in its entirety. Their primary argument is that that forcing Americans to buy health insurance oversteps the bounds of the Commerce Clause in the Constitution, which allows the government to regulate economic activity. But the decision to forgo health insurance is not an economic activity and can’t be regulated, they say. Somewhere along the line, the reportage about the ACA was folded in with this chain email, likely to lend it more weight and spread it farther. However, the two issues are not related. The viral posts and chain emails begin by claiming that members of Congress do not pay into Social Security. As we have previously reported, that is a rumor so outdated as to attain full “hoax” status. The email also said that congressional members would exempt themselves from any proposed healthcare reform package. Members of Congress and most government full time workers already have a healthcare package. The proposed healthcare reform began with the purpose of offering healthcare for those not already covered. For all these reasons, we rate this claim Not True..
For too long we have been complacent about the workings of Congress. Many citizens have no idea that members of Congress can retire with full pay after only one term, that they don’t pay into Social Security and that they have specifically exempted themselves from many of the laws they have passed (such as being exempt from any fear of prosecution for sexual harassment). “Ordinary” citizens must live under all those laws. The latest travesty is that Congress will exempt themselves from the Healthcare Reform that is being considered…in all of its forms. Somehow, that doesn’t seem quite right. We do not have an elite class that is above the law. I truly don’t care if they are Democrats, Republicans, Independents or whatever. The self-serving must stop. “Congress shall make no law that applies to the citizens of the United States that does not apply equally to the Senators and Representatives; and, Congress shall make no law that applies to the Senators and Representatives that does not apply equally to the citizens of the United States”. Each person contact a minimum of twenty people on their email address list, in turn ask each of those to do likewise. In approximately three days, all people in the United States of America will have the Message. This is one proposal that really should be passed around. Subject: 35 STATES SO FAR AND GROWING! I hope you will all send this to as many people as you can. Thanks. SOUNDS LIKE WE’RE ON THE RIGHT PATH—FINALLY! For too long we have been too complacent about the workings of Congress. The latest is to exempt themselves from the Healthcare Reform that passed … in all of its forms. Somehow, that doesn’t seem logical. We do not have an elite that is above the law. I truly don’t care if they are Democrat, Republican, Independent or whatever. The self-serving must stop. This is what Mark Levin has been talking about a constitutional convention by the states to get back to the laws of the Constitution. Governors of 35 states have filed suit against the Federal Government for imposing unlawful burdens upon them. Their latest stunt is to exempt themselves from the Healthcare Reform that they passed … in all of its forms. Somehow, that doesn’t seem logical. We do not have an elite ruling class that is above the law. I truly don’t care if they are Democrat, Republican, Independent, or whatever self-serving must stop. If each person that receives this will forward it on to 15 people, in three days, most people in The United States of America will have the message. You are one of my 15 (or more). Justin Smith posted on my Facebook Group Social Media Jail Conversations for Conservatives & Counterjihadists some thoughts on civil strife that could evolve into a civil war on November 7. I gave Justin’s post the title “The Final Fall Scenario?” Then posted that on November 8 with some editing. On November 9 Justin submitted an expanded version of this post with the title “The Final Journey: The Abyss of Civil War”. Below is that version of the post. America will be unable to continue for much longer through the “give and take” of Congressional politics, when one views the reality of the Democratic Party as thinly veiled Communists of today, who simply take and never give in any so-called “compromise”. Look at the violence that followed President Trump’s election and the tacit support given violent Antifa rioters and Black Lives Matter, and look at the election of Democrat Rashid Tlaib to Michigan’s 13th Congressional District this month, whereupon she wildly waved the Palestinian flag — the flag of Hamas and Muslim terrorists; and one will understand that the far and wide disparity between the ideology of the Democrats and the Republicans will only lead to greater civil strife, setting the stage for a civil war that may not come real soon but soon enough. One cannot reach across the political divide or build bridges with those who will use those bridges to destroy one’s homes. It is astounding to find factions in our exceptional country, who support the Swamp and its expansion, that have united against President Trump and any move towards our Founding Principles [Blog Editor: Expanded views of Founding Principles – HERE & HERE] and real conservative values, that promote great prosperity and individual liberty. These are the crazies of the Left and their Democrat Party useful idiots, Marxists, liberals, elderly hippies, welfare moochers, rabid feminists, LGBTQ bathroom “rights” advocates and rainbow dancing socialists, Black Lives Matter racists, cowardly Antifa thugs, and the Millennial pansy generation who subvert the U.S. Constitution for their taxpayer subsidized paychecks. America is not the same country it was, when I was a boy, several decades ago. She has changed drastically, and not for the better, and Democrats and Republicans are irretrievably divided, as they stare across a wide ideological chasm at each other. On October 9th, 2018, former presidential candidate Hillary Clinton declared that Democrats “cannot be civil” as long as Republicans hold the White House and Congress, adding: “You cannot be civil with a political party that wants to destroy what you stand for, what you care about”. Hell has frozen over. I agree with Hillary. However, I’d ask her, just exactly what is it that she and her fellow “Progressive” Democratic Commie Rats care about? It can’t be America or Her Founding Principles, as we see them cry “racism” whenever they cannot win an ideological debate. They always divert the discussion to race, gender or sexual preference and the “right” of women to abort their unborn children, so much so that their corruption of the FBI and the Department of Justice is never properly addressed and corrected — neither are Hillary’s numerous criminal acts against America. 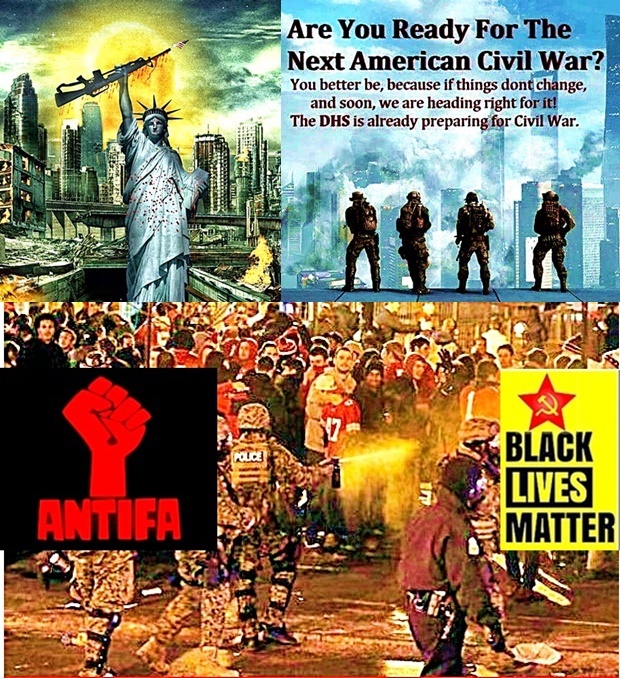 Today, Americans hear young socialists and communists within our nation talking about “fundamentally transforming” America, which simply means creating a new authoritarian socialist state for America and destroying the Constitution and the Republic “by any means necessary”, including violence. We saw the Hillsborough, North Carolina GOP headquarters firebombed last month, Some, such as the Antifa professor from Diablo Valley College who clubbed several pro-Trump people at a rally last year, have very nearly killed people they thought were conservatives or Trump supporters. Antifa attacked my good friend Haley Adams and her family at both the June Prayer Rally and the July Freedom Rally she helped organize this year in Portland, Oregon, sending her elderly father to the hospital after one attack; and all simply due to the fact that she was waving an American flag. Americans have witnessed Leftists, communists and anarchists attack good and decent Americans all across the nation, as they burn the American flag as they did in 2016 in Pittsburgh. From El Cajon, California to Connecticut to Tennessee, Americans have been attacked repeatedly, since 2015, simply for being a Trump supporter or for honoring the American Flag. Despicably, even the elderly are assaulted, as evidenced by the attack on a seventy-one year old female staffer for California GOP Representative Dana Rohrabacher last year. And it is well documented that Black Lives Matter and Antifa have shot at and shot and killed or wounded several people, over the last few years. The Left and the Democratic Party has now cast aside its once veiled-veneer of civility and all remaining pretense. It still pursues its suicidal sovereignty killing mission through neo-Orwellian Agenda 21 regulations, gun confiscation, government-mandated politically correct orthodoxies and the suppression of Free Speech and dissent — especially in regard to any criticism of Islam — more fiercely than even the mainstream media currently demonstrates. Sadly, there is not much that unites us today. The Communists of America, the Democratic Progressives, call decent Americans, who support and defend the Constitution, “deplorables, racist, homophobic, Islamophobic and every other vile name under the sun.” And most often, we are referred to as fascists and Nazis. These are the anti-Christians and anti-Americans — the secular humanists intent on purging Christianity from our society — bent on the destruction of the Republic. Their vulgar outbreaks of violence are a growing movement intent on bringing down America. How can anyone find any “compromise” with this sort of EVIL and this agenda, and why would anyone want to do so? My people, who love America and understand Her Founding Principles and Her Exceptionalism, want America to return to ‘E Pluribus Unum’ and a national community grounded in the desire for individual freedom, but it is far too obvious today that this will not happen without a struggle. Our enemies hate our God-given inalienable rights to speak freely, to worship freely and to keep and bear arms, and they will hate and attack us even more once they ever regain power. Understand this and be ready to defend your life and liberty by exercising your right to do so. 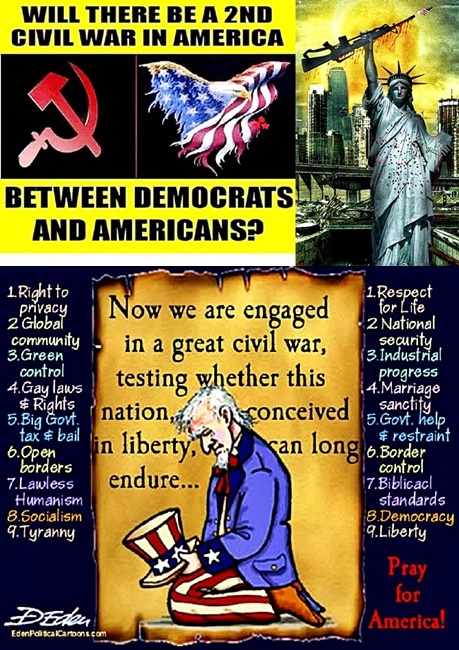 Any decent American cannot abide by the totalitarian ideology the Democratic Party would foist upon them, if the Democrats were given the chance, and should this nation and the patriots of Our Republic find themselves forced to take up arms to hold their rights and preserve Liberty, one need look no farther than the illiberal Democratic Party and its fascist ranks. History will record they pushed America into the abyss of civil war and brought down a darkness on our society through their ideology and their death wish, blurring the shape of beauty and normalcy, the definition of virtue, the edges of truth. The battle for the heart and soul of America will continue for some time. These events, this juncture in history at this hour, represent the most sickening things I have witnessed in my many years on this earth. The war is ahead of us, and the ending will be much like that of the final fall of Rome. Be blessed my friends, for we are on the final journey. Source links and text enclosed by brackets are by the Editor. How old were you on September 11, 2001? Were or are you old enough to remember what happened that Tuesday morning? I was 44. I was off work that morning and was sleeping while most of New York City was going full bore with their work day. My wife and I were enjoying the cuddling of blissful sleep. I got a phone call from a friend of mine. He told me to turn on my TV to any channel. I was shocked to hear a passenger airline had crashed into one of the Twin Towers of the World Trade Center (WTC). I can’t recall how long I was watching the television report and with the cameras on the smoking building – BOOM! Another passenger airliner crashed into Twin Tower. TV reports began to filter in. This was no tragic accident. Passenger jets had been hijacked and deliberately flown into the WTC. Two other passenger jets were hijacked. One flew into the Pentagon and the other crashed in a field near Shanksville, PA. The WTCHP has certified 37,000 people as suffering from serious respiratory or digestive illnesses, cancer, or a combination. The Manhattan borough president, Gale Brewer, told the Guardian she had “heard very high numbers” of people were at risk of dying from exposure to World Trade Center-related toxins. 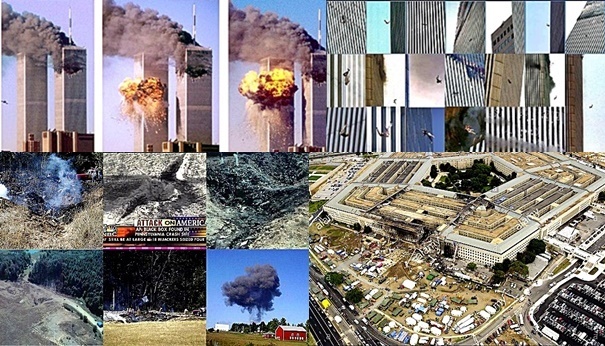 911 is the day Quranic, Hadith and Sira based Islamic ideology were honored by Muslim followers. It has been seventeen years, since Islamic terrorists used jet airliners as guided missiles to bring down the World Trade Center Towers and six years since Islamic terrorists overran the U.S. Consulate in Benghazi, Libya and murdered four fine Americans, including Ambassador Chris Stevens. Most of us remember these days clear as a bell ringing out in the dead of night, and we swore that we would never forget what transpired on these days. We swore we would make certain it could never happen again. And yet, through a multitude of continued Islamic inspired terror attacks, from those days to the present, America does not stand united in this war between civilizations or stand shoulder to shoulder in the war against Islamic terrorism and the evil ideology inherent to its core doctrines. Try reporting on the five Muslims in New Mexico, who were recently caught abusing and training children to become Islamic jihadi terrorists or the 35 similar and verifiable Islamic jihadi terrorist camps, along with a possible 200 more such camps, scattered across America, and just watch how fast the slurs of “racist” and “bigot” are thrown at any reporter’s good name. America said, “We will never forget”, but from the manner in which we approach Islam and our Muslim population, it seems that many, especially the Democrats, have already forgotten, so anxious are they to appease Muslims and Islam in general and be seen as “enlightened and loving” and willing to “coexist”. They do not understand that “coexist” is simply a synonym for “surrender”. Each time there is a new terror attack carried out on our homeland or a terror threat is neutralized and another Muslim terrorist is taken down by Homeland Security, or some other U.S. agency, the media goes into action, and it is ludicrous to watch. We stand united, we are not cowed, the terrorists will never win are repeated over and over by Congressmen, police chiefs, mayors and former U.S. presidents such as Obama, Carter, Clinton and Bush — the mantra of multicultural acceptance and tolerance, the same script, time and time again. The truth is that life has not proceeded as normal, since American Airlines Flight 11 slammed into the side of the north tower of the World Trade Center at 8:46 a.m.. Our sons and daughters were obliterated, burned alive and left crumpled in pieces inside the collapsed rubble of the Twin Towers, and the terror attacks have continued, largely unabated, from Boston to Chattanooga to San Bernardino. Let’s not forget, as recent as December 11, 2017 an Islamic terrorist from Bangladesh attempted to murder Americans with a homemade pipe bomb in New York’s Port Authority Bus Terminal. Akayed Ullah was a Muslim who pledged his loyalty to the Islamic State. And then there’s U.S. Army Sergeant First Class Ikaika Kang, who just plead guilty in August to providing the Islamic State with military information and equipment, a drone, and training. America must never forget September 11th and its lessons, so long as American mothers and fathers are still burying their sons and daughters, due to Islamic terrorism on our own soil. If September 11, 2001 was anything, it should have been a wake-up call and an in-your-face moment of realization that despite all the multiculturalist, socialist and communist Democrat and RINO assurances that Islam is “a religion of peace”, it is, in fact, and evil ideology that hates all others to the point of not resting, until all outside of Islam either submit and enter its sphere or die fighting, or until Islam itself is no more. Islam hates the “other”, the Christians and Jews, the Europeans and Americans. If anything, America should never forget September 11th and Benghazi, when Ambassador Chris Stevens’ body was dragged through the streets, by a crowd of howling, screaming Muslims, and just how deep Islamic hatred goes for all outside Dar al- Islam, the House of Islam. Whether in America, Europe or the streets of Cairo or Benghazi, wherever “peace missions” are pursued, Americans can never “coexist” with Islam and they should not even try. I am constantly attacked by the Left, for failing in the commandment “forgive your brother as you forgive yourself”. Muslims are not my “brother” in any Christian sense of the word, because they themselves reject such a brotherhood based in love, and they are not seeking forgiveness, as their repeated attacks on the West clearly demonstrate; but rather they embrace a supremacist ideology based in hate and founded on conquest and subjugation. God might forgive evil deeds, but even Satan was still condemned to a lake of fire. I can forgive honest mistakes and deeds done in the heat of passion, by normally good people, but as far as evil perpetrated with clear purpose and a longtime strategy aimed at ending my people’s way of life and eradicating Judeo-Christian principles, I will never forgive such evil. Is American life carrying on as normal, when now we see Christians attacked in Muslim “no go zones” like Dearborn, Michigan, for the “crime” of proselytizing near an Islamic festival? How normal has life been for young Americans, such as Wyatt and Lucy Paterson, twins, who lost their dad in the Twin Towers, at the age of four? What about the survivors from the families of the other 2996 Americans murdered on that day? What about Genelle Guzman, the last survivor pulled from the rubble of the Twin Towers, who spent six weeks in the hospital undergoing surgeries on her crushed legs? How normal has life been for Dorothy Woods, widow of Tyrone Woods killed in Benghazi, or Kate Quigley, whose brother Glen Doherty died fighting alongside Woods? Life in America will never return to normal, as long as we fail to learn the lessons of 9/11 and keep buying the Leftists’ assertion that Islam is “a religion of peace” and the fool’s errand of “coexistence” with Islam, allowing Islam and the Muslim population to grow in America. Each time we remember the events surrounding 9/11/2001 and 2012 and all the Islamic terror and chaos that has followed, all Americans, who love America, must not only reject Islam’s status as a “religion”, but we must vow and work to eradicate Islam from America, by enforcing section 212 (f) of the 1952 McCarran Act, which focuses on any group like communists whose presence proves detrimental to the United States; and, we must halt all mosque construction and all Muslim immigration, since Islam is an evil and violent ideology focused on either America’s subjugation under Sharia Law or her ultimate destruction. I will never forget 9/11, and neither should you.